Is crime in West Hampstead on the rise, or are we just made more aware of it through social media? And through the rare but higher-profile crimes such as moped-based thefts or the recent acid attack. WHL met up with Sergeant Mark Townsend to discuss. 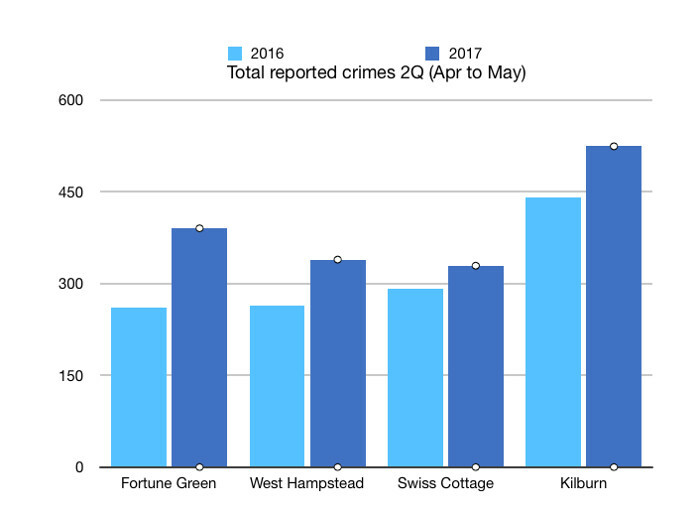 Certainly there is a sense that our relatively quiet part of north-west London has seen more crime of late, but do the statistics back that up? And what are the police doing about it? Crime stats are available from the College of Policing website and are broken down by wards: Fortune Green, West Hampstead, plus parts of Swiss Cottage and Kilburn that make up ‘West Hampstead’. The numbers are a couple of months behind with the most recent figures being for June. 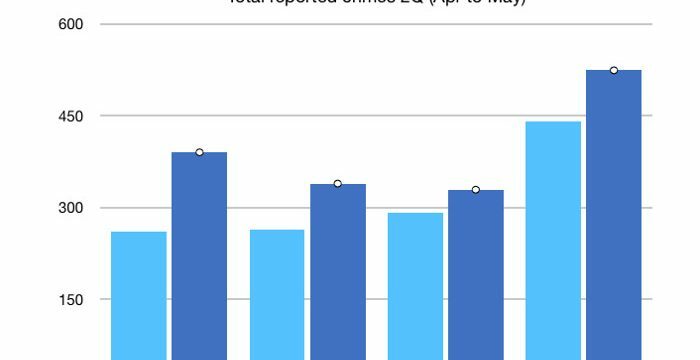 Given that crime levels are generally relatively low, increases can be seasonal or statistically not significant, however, the data does suggest a rise in crime. 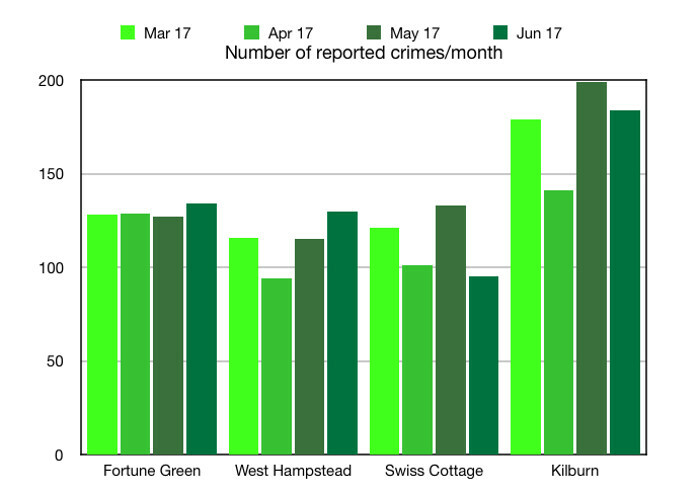 As you can see from the chart, across the previous few months, monthly crime levels are actually fairly stable, with the exception of Kilburn, where crime is somewhat higher overall. However if you compare it with the same period last year it’s clearer that the trend is upwards. 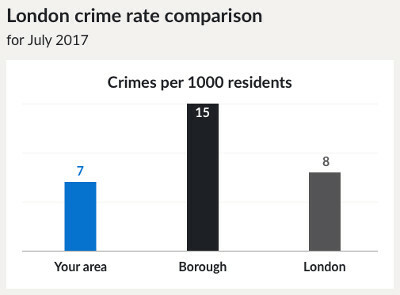 There is an average rise of 15% for the wards and a startling 50% jump in Fortune Green, confirming anecdotal (or tweetendotal) evidence that crime is on the up. Of course it’s important to know what types of crime are causing the increase. In Fortune Green, it’s largely a rise in burglaries and thefts from cars. From April to Jun 2016 (2Q) there were 31 burglaries in Fortune Green, but that had nearly doubled to 55 in 2017. Likewise from April to June 2016 there were 43 theft from cars, but in 2017 that rose to 78. Here is a breakdown of which crimes make up the total. It is important to point out that West Hampstead is still relatively safe, but not as safe as it was. It is now about average for London, although still safer than Camden overall. FG ward’s relative position in the crime tables. These monthly stats are important because they alert the police to any hot spots and allow the Safer Neighbourhoods ward panels to decide crime priorities. Its is really important that you let the police know if you are victim of crime. How can the police make our neighbourhood safer? Sgt Mark Townsend has been at West Hampstead for two years and in the force for 13 years. He is in charge of three Safer Neighbourhood teams: Fortune Green, West Hampstead and Kilburn. 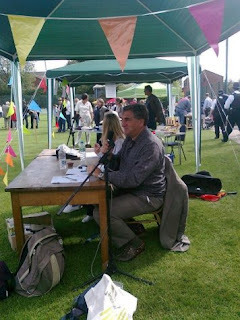 Although the teams are separate, they do support for each other and coordinate on problems at the ward boundaries. West Hampstead and Fortune Green have two PCs each and one PCSO. Kilburn, with its higher crime rate, has four PCs and one PCSO. Alongside the Safer Neighbourhoods Teams there are response teams (these are the officers who respond to and investigate crimes) based at Kentish Town police station. There are more changes in the pipeline as earlier this year Camden’s force merged with Islington. This merger is one of two pilots in London – the other is a merger of three east London boroughs. The aim is to turn what thirty London borough forces into 16 policing areas. Therefore further mergers are on the cards as are cuts to police numbers. Numbers are down already. In March 2010, there were 33,367 full-time officers in London. This had fallen to 31,782 in by March 2016 (both numbers include long-term absentees, currently about 1,000 officers). With burglary and theft from cars on the rise, residents can play their part in making it harder for criminals. Sgt Townsend said that one of his biggest problems is people being lax with their own security. Car doors should always be locked (and anything valuable hidden out of sight), and mopeds should have a disk lock and be secured to the ground. All the oft-repeated advice about securing lower-ground floor flats and being careful not to leave communal doors open or letting in random people to communal flats without checking naturally apply too. If anyone wants to report something suspicious they can also call Crimestoppers on 0800 555 111 – or do it anonymously online, though this means you’ll have no follow up and the police can’t ask for more details. You can also report it directly the Safer Neighbourhoods teams where they can follow up. Nevertheless, it is important to report a crime, and today the best way to do this is online, although there can be an urge to talk to a real person straight away. Four out of five crimes can now be reported online, even car collisions. The reasons to report all crime, apart from having it investigated, is that it then gets included in those crime stats, which themselves shape the police force’s priorities. Those priorities are updated on the police college site, and the Metropolitan Police pages for each ward’s Safer Neighbourhood Teams (Fortune Green , West Hampstead and Kilburn). The Met’s site is still in beta, and could be more user-friendly, for example with photos of team members, which would make it more personable, though there are other attempts to modernise the service and make policing more visible. Kilburn Safer Neighbourhood team got smartphones about a year ago and have been tweeting more and more actively . Initially, Sgt Townsend said the team was unsure about this, but they have grown more comfortable with the idea and now eagerly report their successes and ward rounds. There are also Twitter account for Fortune Green and West Hampstead, but they are less achieve and specific than Kilburn, but with time should be more informative. The crime stats are supposed to help the police together with the Safer Neighbourhood Panels (SNP) decide what the crime priorities are for the area. Recently this has been drifting due to a change in personnel, however, earlier this year local activist Miles Seaman has taken over. He has been working at reactivating the SNP by ensuring the the meetings are more regular and issues are raised in an orderly fashion. Confusingly, the police also ask for input about which crime priorities on the Safer Neighbourhoods website, but with only 4 votes last month it’s not very democratic. So crime indeed has been on the rise in the area. The question is what to do now? Firstly, Sgt Townsend says please take personal responsibility, it is astonishing that the number of thefts that take place from unlocked cars. Given that we are facing continued cuts in police numbers this is all the more important. The Safer Neighbourhood Team numbers are safe. For the moment. But WHL thinks the police can also do their bit – they have been very slow to take up social media and their websites are – to say the least – clunky. A lot of local policing is know the faces of the bobbies (or PCSOs) on the beat but all we have are grey boxes, nor are their links to the email addresses or a phone number to contact the teams. The Safer Neighbourhoods panel should hopefully be more pro-active under new chairmanship. Likewise we also haven’t seen much activity from our local councillors (or indeed from the local opposition), but we are happy to be corrected on this. There is concern about releasing CCTV footage when crimes are committed. WHL has his wallet stolen in Costa coffee (doing an interview about crime, how’s that for irony) but Costa refused to release the footage even though the thief was caught on camera. Sgt Townsend thinks it is time to take a more sensible approach because the police don’t have the resources to follow up. One example over the past year of everyone pulling together (including WHL) was on improving the Black Path and Billy Fury Way. Both paths had become overgrown and felt unsafe, this resulted in a few incidents. Last August WHL and a number of locals turned out to start cutting it back and this galvanised Network Rail into action, thanks to help of the Police and local councillors. The overgrown foliage has been cut back, the lighting is improved, the path resurfaced and, that bit at least, is now a safer part of the neighbourhood. 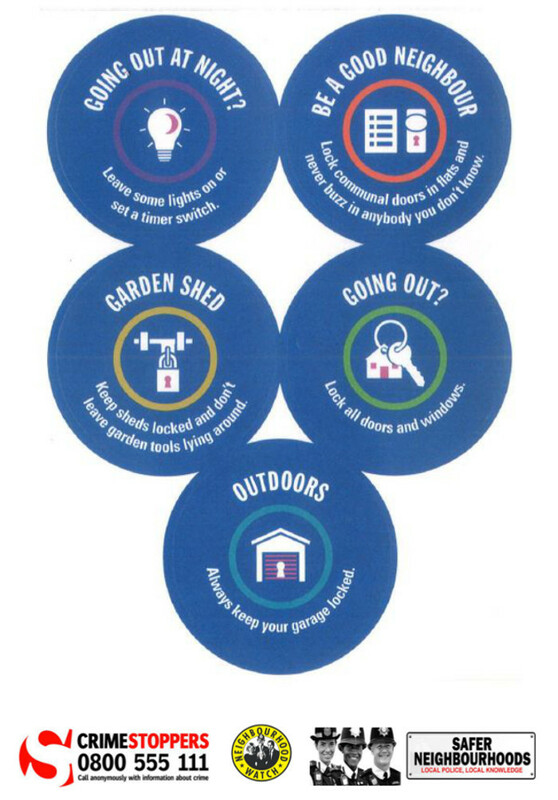 And finally, here is some simple crime prevention advice from the Safer Neighbourhoods Team. Stay safe West Hampstead.